Global bleached chemical market pulp capacity reached 64Mt/y in 2017, comprising 35.3Mt/y of hardwood market pulp, 28.3Mt/y of softwood, and just 0.4Mt/y of sulphite pulp. Capacity expanded by 3.7% last year, equivalent to +2.3Mt; a rather strong expansion when compared to the 2.5% (+1.3Mt) average growth rate of the previous decade. • BSKP capacity increased by almost 1.1Mt, driven mainly by the continued ramp-up at Södra’s Värö mill, the start of the new line at Metsä Fibre Aänekoski, and the first full-year of operations at Domtar’s Ashdown and IP’s Riegelwood SBSK/fluff mills as well as at Klabin’s PUMA mill in Brazil. • The latter also contributed to BHKP capacity growth of around 1.2 Mt during 2017. In addition, the gradual ramp-up at APP OKI, and the start of Fibria’s second line at Tres Lagoas helped to offset the cuts resulting from conversions at APRIL Rizhao & Kerinci. 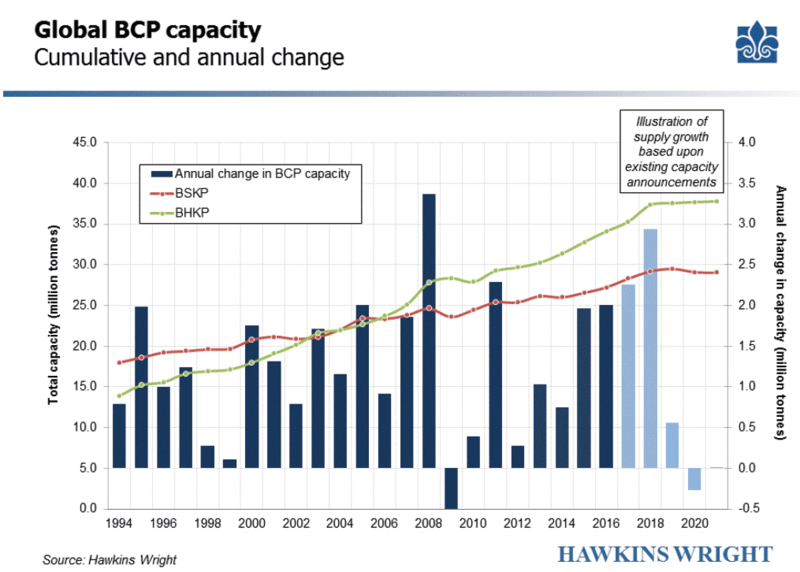 As the chart shows, BCP capacity has now enjoyed three years of above trend growth; with a further 4Mt added through 2015 and 2016. Nevertheless, it is 2018 which will see the peak of the current investment cycle, with an estimated 3Mt of new capacity scheduled to come online over the next twelve months. This represents the strongest rate of expansion since 2008, after which capacity contracted quite sharply as a result of the global financial crisis, which obliged many high cost facilities to shut down due to the collapse in demand. Whilst few are predicting such macro-economic shocks through 2018- 19, capacity growth still appears likely to decelerate sharply through 2019 and 2020 with only incremental growth resulting from debottlenecking projects or “creep”, combining with a number of planned conversions to dissolving pulp production which would cause a reduction in paper grade pulp supply if they proceed as currently planned. These projections are constantly revised as events unfold and plans change, and capacity rarely corresponds to actual supply. We note that whilst capacity increased by 6.2Mt in the three years 2015-2017, shipments grew by just less than 5Mt. As such, there remains a great deal of latent supply which could become visible over the months to come, thereby exaggerating what is already a strong year of growth. Equally, we are very well aware of the challenges and uncertainties which might very well continue to suppress production, even as capacity rises. Our main assumptions are summarised in the paragraphs which follow. Softwood market pulp capacity is expected to grow by 0.74Mt during the period 2018-2021; NBSK supply will expand by 1.4Mt while that for both southern softwood and other softwoods will decline by 0.14Mt and 0.52Mt respectively. This year, BSKP capacity will rise by 0.9Mt and reach 29.2Mt/y. • The single-biggest addition to supply will come from Metsä Fibre’s Aänekoski line, which started in Q3 this year and is already close to its full design potential of 1.3Mt/y. Because the previous line has been retired, in reality the net addition is 0.7Mt, of which we apportion 0.5Mt in 2018. • The second biggest contributor will be the Svetlogorsk mill in Belarus, and here we must acknowledge a greater degree of risk. The mill has only recently begun trials after two years of delays, and we assume a gradual ramp-up over 2018 and 2019 resulting in an additional 0.25Mt of softwood capacity this year. • A newly expanded pulp line is scheduled to start at SCA’s Ostrand mill in June 2018, which will increase capacity at the mill by an estimated 0.1Mt this year and 0.5Mt next year. There are no other softwood projects in the pipeline, implying capacity growth will slow to just 0.3Mt in 2019, and could even contract in 2020 and 2021 (-0.5Mt altogether) as certain companies convert capacity to dissolving pulp. The main protagonists are Arauco (Valdivia, from mid-2019) and Stora Enso (Enocell, also in late 2019) which might reduce BSKP capacity by 0.4Mt and 0.3Mt respectively. Smaller reductions may result from the gradual conversion of APRIL’s Rizhao mill in China (on the smaller line), and Rayonier’s Jesup mill in the US which is gradually phasing out fluff production. Hardwood market pulp capacity is expected to grow by 2.5Mt during the period 2018-2021; BEKP supply will expand by 1.94Mt while Asian hardwood (eucalyptus and acacia) supply will grow by 0.52Mt. Minor gains in birch supply in Finland, and reductions in mixed hardwood supply in the US will cancel each other out. This year will see the biggest rise in BHKP capacity in a decade, with global capacity expanding by just over 2Mt and reaching 37.4Mt/y. The growth will mostly come from the first full year of operations at both Fibria’s Tres Lagoas (+1.38Mt) II and at APP OKI (+1Mt). • As ever, there remain some doubts about the actual market supply from APP Indonesia, which are partly the result of mechanical issues and partly the fact that the amount of BHKP absorbed by the group’s numerous paper, board, and tissue mills in both China and Indonesia may be subject to change depending on market conditions. The ongoing acquisition of Eldorado by Paper Excellence adds another dimension to the uncertainty. • Although we anticipate the continued smooth ramp up at Tres Lagoas, overall net growth from Fibria will be reduced by around 0.25Mt/y owing to fibre constraints affecting the Aracruz mill, which are likely to persist beyond 2018. • Similar reductions in supply are expected from the APRIL Group mills, both in Indonesia and China. Sister company Sateri is adding around 1Mt/y viscose capacity in Jiangxi (China) and Kernici (Indonesia), and uses mostly affiliated dissolving pulp supply from recently converted lines in Rizhao and Kerinci. APRIL Fine Paper has also installed around 750,000t/y of uncoated paper capacity in Xinhui and Kerinci over the past eighteen months, which has absorbed over 0.5 million tonnes of the group’s BHKP output. • Finnish birch capacity is also expected to rise this year, largely as a result of Metsä Fibre Aänekoski, but also elsewhere. Beyond 2018, BHKP capacity growth is set to slow dramatically, with less than 0.5Mt net growth over the three years 2019-2021. Most of this growth will take place in Brazil, resulting from the ramp-up at Fibria Tres Lagoas, and some debottlenecking investments by Suzano at Mucuri and Maranhao. ENCE also plans incremental expansions at Navia and Pontevedra in Spain. Note that we have also recently included the Vietracimex project in central Vietnam, which we assume will contribute 0.4Mt/y growth in 2019-2020. Although there is little information in the public domain, we are aware that equipment from Sodra’s Tofte mill in Norway has been relocated and is now being re-assembled in Quang Ngai, south-central Vietnam. Progress has been fairly slow to date, and any further delays could reduce the net capacity growth even further. These assumptions will almost certainly revised once more over the next twelve months. We rarely adjust capacity for temporary events which disrupt supply (e.g. mechanical failure, weather, industrial action. etc), however, where issues recur or persist we may review our assumptions. For example, one area of major uncertainty concerns access to peatland plantations in Indonesia following revisions to previously approved plans (RKU’s) by the Indonesian authorities. In a press release dated 21 December APRIL has pledged to work within the new directives, whilst warning that business activities will be significantly impacted. At the same time, market conditions inevitably dictate supply in the medium term, and the increasing influence of the viscose sector is particularly relevant here, as the volume of “swing” capacity rises. At present for example, the narrow differential between paper grade and dissolving pulp in China encourage production of the former. It will also be interesting to see how the industry reacts to the apparent lack of new supply on the horizon. There is already a discernible change in rhetoric over the past twelve months, particularly as pulp prices have increased. Most of the leading Latin American companies have hinted that major projects could be announced in the months to come, and as earnings and valuations rise, the opportunities for consolidation appear to diminish. However, given the capital intensive nature of pulp production, and the long lead times to construct new lines, it seems there are only one or two brownfield projects which could conceivably be realised by 2021. As such it appears that the long-term and short-term cycles which so characterise our industry remain well entrenched. 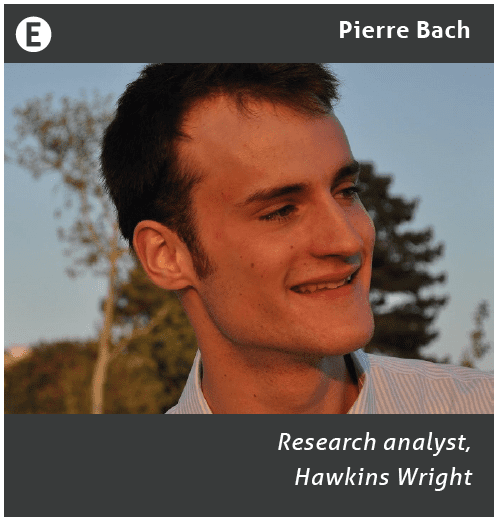 This article was also published in Pulpwatch, Hawkins Wright’s monthly analytical newsletter focusing on developments from across global pulp markets. The data references the Outlook for Market Pulp report, a multi-client service comprised of in-depth analysis of demand and supply fundamentals as well as production costs of the global pulp industry, and five-year price forecasts for North America, Europe and China. Share the post "Market pulp capacity review: investment cycle to peak in 2018"